Surely the facts are subject to change. 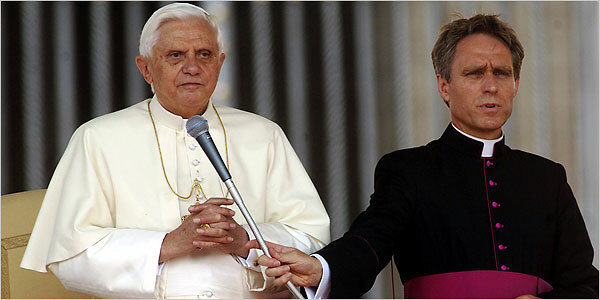 “Pope Benedict XVI has said the use of condoms is acceptable “in certain cases”, according to a new book. He said condoms could reduce the risk of infection with HIV, such as for a prostitute, in a series of interviews he gave to a German journalist. Well I for one never doubted that Il Papa insisted the rent boys wore rubbers. Isn’t that right Georg? “The comments appear to soften the Roman Catholic Church’s hardline stance, which until now had banned the use of any form of contraception. “It of course does not see it as a real and moral solution. A “Sign of the Times”? “The Pope gives the example of the use of condoms by prostitutes as “a first step towards moralisation”, even though condoms are “not really the way to deal with the evil of HIV infection”. “The Church’s hardline stance over contraception has led the Vatican to being heavily criticised for its position in the context of the Aids crisis. On a visit to Cameroon last year, the Pope said the use of condoms could endanger public health and increase the problem of HIV/Aids, rather than help to contain the virus. This drew criticism from several EU states. Campaigners say condoms are one of the few methods proven to stop the spread of HIV. I’m sure Larry Kramer will be first in line to buy a copy. It’s always important to wear your rubbers. Isn’t that right Betty?